Far back in time, the Scots quibbled endlessly over what turn out to be microscopically differing varieties of the same faith. Sound familiar? The journeys they made to escape each other were extraordinary, to the point that it's an incredible shame they didn't have anything better to think about - just imagine what they could have accomplished if all those energies and ingenuity could have been applied to something useful. Many of them emigrated to Nova Scotia, and here's where it gets really unbelievable - savage winters and the potato blight drove them to build new boats which they sailed to Australia and sold for profit. Finding the hedonistic culture of the gold rush in Melbourne not to their taste, they then built further boats and sailed again, across the Tasman Sea and round the northern tip of New Zealand, at last landing in Whangarei Heads, at the top of the North Island. Here, finally, they stayed. Traces of the culture they brought with them still remain - place names and a typically severe but unintentionally pretty church - though they're not as well known as at Waipu, a lengthy drive but shorter sail from the Heads. It's a fascinating place. The Heads is basically a peninsula - my favourite kind of riding, the views change almost by the minute when you get up high - jutting out towards Marsden Point, unfortunately the site of New Zealand's only oil refinery, on the mainland. The whole thing is very pretty, and very hilly; top country for a bike tour but very tiring altogether. Here's a sample ride, a beautiful medium day out on the bike. 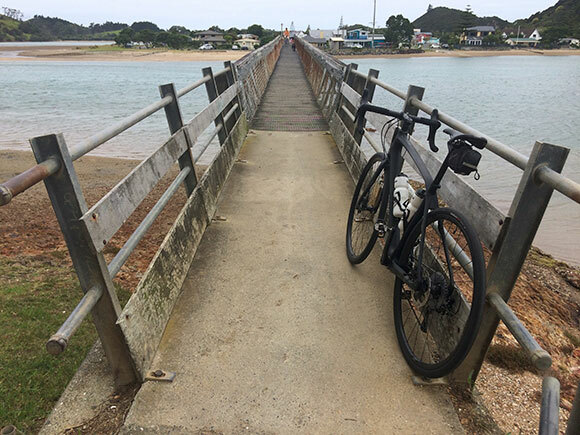 The roads out to Pataua from Whangarei Heads in the south, and Tahere in the north, don't have much traffic on them because at Pataua, on Ngunguru Bay, the only bridge over the Pataua river is for pedestrians. And bikes... may it ever be this way. It's idyllic cycling through Pacific bush with occassional views out to sea and over toward the Glenbervie forest. Tiger mountain itself is a fierce climb up from Whareroa, with many false tops. The rugged interior of the pensinsula is very different to the serene coast. Close to Pataua, the few cars you do meet need to be watched - because the roads go only to the coast, those cars are likely to be driven either by farmers, or by mothers on the school run. You get my drift.